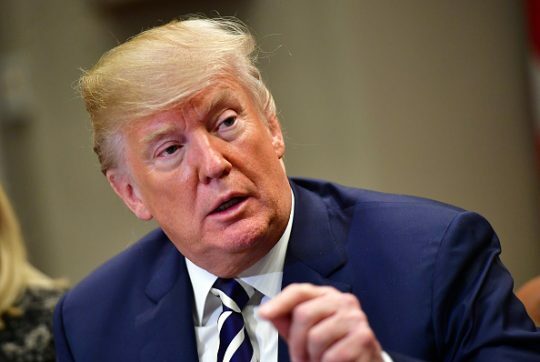 President Donald Trump on Tuesday said it was "disgraceful" the questions special counsel Robert Mueller wants to ask him were leaked to the media, but said none of the questions pertain to collusion with Russia. Trump's early morning tweet refers to a New York Times report that was published Monday evening, detailing more than 40 questions Mueller would like to ask Trump in the ongoing investigation of Russia’s interference in the 2016 election. "So disgraceful that the questions concerning the Russian Witch Hunt were ‘leaked' to the media. No questions on Collusion. Oh, I see…you have a made up, phony crime, Collusion, that never existed, and an investigation begun with illegally leaked classified information. Nice!" Trump tweeted. So disgraceful that the questions concerning the Russian Witch Hunt were "leaked" to the media. No questions on Collusion. Oh, I see…you have a made up, phony crime, Collusion, that never existed, and an investigation begun with illegally leaked classified information. Nice! "It would seem very hard to obstruct justice for a crime that never happened! Witch Hunt!" Trump tweeted. The four dozen questions that were obtained by the Times from a person outside of Trump’s legal team included open-ended queries designed to try and penetrate the president's thinking and look into the motivation behind some of his tweets. The Times pointed out that a few questions also relate to Trump campaign aides' behavior toward Russia. "What efforts were made to reach out to Mr. Flynn about seeking immunity or possible pardon?" Mr. Mueller planned to ask, according to questions read by the special counsel investigators to the president’s lawyers, who compiled them into a list. That document was provided to The Times by a person outside Mr. Trump’s legal team. A few questions reveal that Mr. Mueller is still investigating possible coordination between the Trump campaign and Russia. In one of the more tantalizing inquiries, Mr. Mueller asks what Mr. Trump knew about campaign aides, including the former chairman Paul Manafort, seeking assistance from Moscow: "What knowledge did you have of any outreach by your campaign, including by Paul Manafort, to Russia about potential assistance to the campaign?" No such outreach has been revealed publicly. Trump also tweeted about a U.S delegation traveling to China later this week for trade meetings with Chinese officials. "Delegation heading to China to begin talks on the Massive Trade Deficit that has been created with our Country. Very much like North Korea, this should have been fixed years ago, not now. Same with other countries and NAFTA…but it will all get done. Great Potential for USA!" Trump tweeted. Delegation heading to China to begin talks on the Massive Trade Deficit that has been created with our Country. Very much like North Korea, this should have been fixed years ago, not now. Same with other countries and NAFTA…but it will all get done. Great Potential for USA! Secretary of the Treasury Steven Mnuchin will be joined by a number of top U.S. officials, including Trade Representative Robert Lighthizer, Commerce Secretary Wilbur Ross, White House trade advisor Peter Navarro, and White House economic advisor Larry Kudlow. The group aims to address the trade deficit with China and issues related to intellectual property theft. This entry was posted in Politics and tagged China, Donald Trump, Robert Mueller, Russia, Steven Mnuchin. Bookmark the permalink.